This demo evening is one of several events planned by White Lotus Gallery around their exhibit Hamanishi’s Splendor: The Art of Mezzotint and Gold Leaf, in the gallery from July 15 to August 26, 2017. The mezzotint, arguably the most difficult of printmaking techniques, was invented in 17th century Amsterdam and flourished in 18th century England. Because of its ability to convey texture and tone, it was used primarily as a way to disseminate reproductions of paintings. 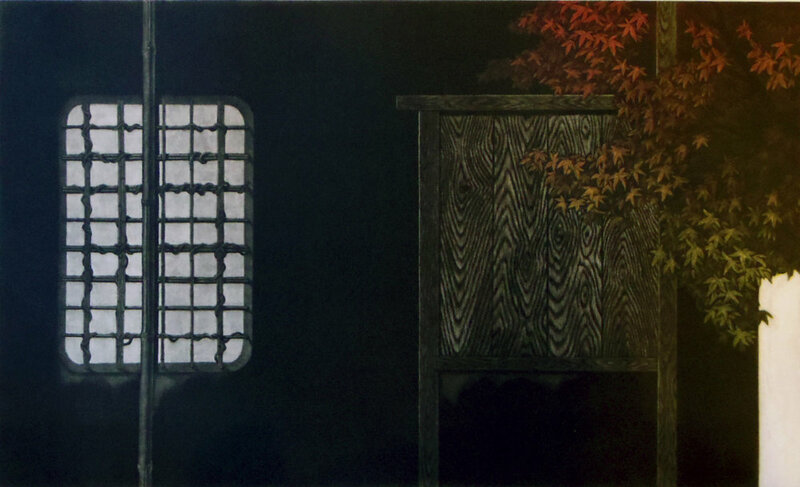 World-renowned contemporary Japanese master printmaker Katsunori Hamanishi has realized with unparalleled skill and elegance of expression the potential inherent in this technique. Hamanishi’s early prints depict sculptural models that the artist often created using various objects like roof tiles tied with fabric which shows the artist’s virtuosity with the medium. Some of his abstracts combine micro and macro views of rice grains and rice paddies punctuated with gorgeous and vivid colors. His more recent work incorporates traditional Japanese themes and aesthetics such as the kimono and stylized views of nature made opulent with various techniques of adding gold leaf, silver, and mica.